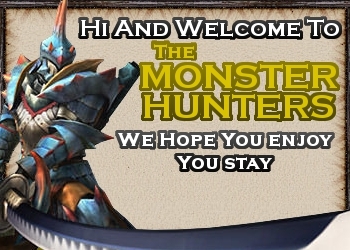 Well X is more than me Im more of a Monster Hunter Portable 3rd guy, but WELCOME Hope you enjoy your stay and have fun! Dont be shy to ask for help but remember, discussing about piracy, hacking, cheating and other of the sort is NOT tolerated here. Wow glad to see Willmason you like this forum after searching for it for that long. Yep, I've only been here like 2 years and i have grown to treasure it, and it gets better specially with new members like yourselves. lol Bulldrome was the greatest pain in the neck....and still is. The serpentblade is grea weapon, I used it a lot when I was first a beginner....Ahhh the memories! Nearly every single country probebly does? not many people are keen on games with monsters or something.but i think the real reason is because not many people are takeing intrest of psp's-Xbox 360 and PS3 are big hits-theres no monster hunter games on them so yh i think thts why MH is not a popular game-the reason i found out about it was MH tri. I saw it and i thought tht was my kinda game-then i found MHFU on psp and i loved it. Yeah its that AND the fact that the PSP is getting old so people arent that interested...but in Japan, at least 8/10 people play Monster Hunter. I mean in Japan Monster Hunter is HUGE! No matter what its on, like in 2010, Monster Hunter Portable 3rd did great in Japan even though it was on the PSP, and it also saved the 3DS in Japan because it was practically dead there until MH3G came out. Maybe CAPCOM will try to release MH3G outside of Japan or something. I hope they do release MH3G-i just got a 3ds for ma b-day, Plus they need to make new psp games-wen ever i go in the shop its always the same ones-but hey it doesnt stop me playing it. i have a Xbox 360 but to be honest i dont go on it much-im always on the psp.